Large 2 bed, lounge / dining room, kitchen , bathroom, ground floor - self catering apartment. 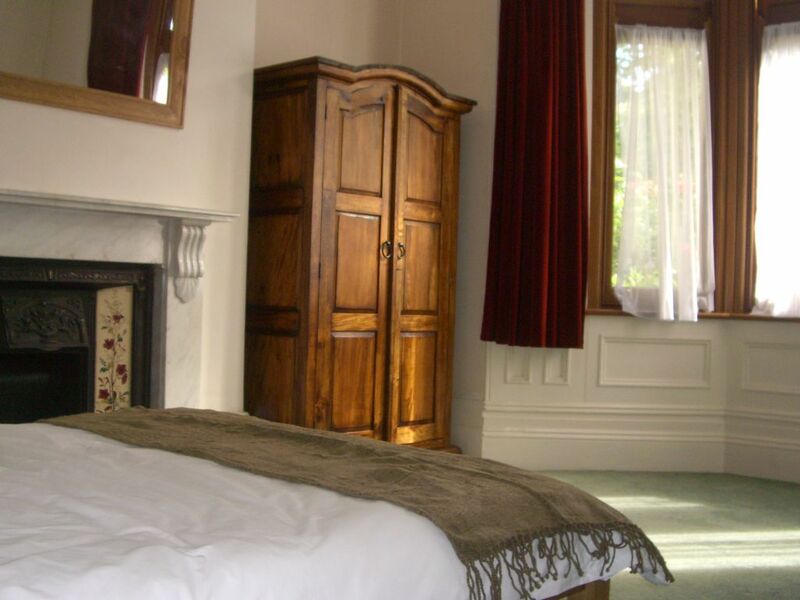 Housed in a handsome Victorian villa which is on Cardiff's most prestigious road. This highly sought after location is adjacent to Pontcanna fields in the heart of this conservation area. Any breakage / damage must be notified to owner immediately. No smoking anywhere on the property including the gardens. Simple - bigger than a B&B, less expensive (and larger) than any hotel suite you can find in Cardiff. Ground floor location - it also has access to it's own small court yard area - as well as garden. Also includes washing facilities, clothes line, ironing board etc - a home from home. The reaction we get from everyone is wow - I didn't think it would be so large. I also know Cardiff - where to go, what to see, how to get there and always happy to advise if you need anything. We are flexible with check in / out times - as long as there are no same day bookings. Bathroom, bath, with shower, basin, mirror , storage and toilet. All bedding, linen and towels are provided (please let us know if you are bringing your own towels). Ironing board and iron available, hair dryer, child's travel cot available - please bring your own bedding for cot. There is a washing machine provided in the out house, along with an additional fridge / freezer if required. Kitchen has an electric oven and 4ring gas hob, microwave, kettle and all the usual items you'd expect to find in a kitchen. We provide tea and coffee for you. Any questions please contact us. Good organization, clean house, peaceful to stay and warm welcome. Everything was just fine. We hope to come back next year ! This listing was everything as advertised. It is a very clean and well maintained property withing walking proximity to everything in downtown Cardiff. The facilities were very good and perfect for my son who has severe food allergies- so we cooked all our own meals. The owner and his family were extremely nice, welcoming and helpful when we had questions about the city. I will be back and will highly recommend to friends and family. We are currently still staying at the apartment, waiting on our son to visit us. He is studying in lovely Cardiff , it is April - and the sun is extraordinarily hot. This place is lovely, large, spacious , old Victorian type style with other more modern things as well. At this time of year the tress are starting to come out, the whole outstanding , all victorian architecture. Kitchen, bathroom all very well equipped and v clean. We (4 adults) spent a perfect week in Cardiff. The apartment was well located, perfect in size, very clean, well equipped and with a lot of charm. We very much enjoyed the hospitality of the owner and his family, who could help us with some good advice, even before we have arrived. We (a German couple) had a very nice week with our two adult sons, staying in this very clean and charming appartment. Located about 15 min footwalk through the amazing Bute-Park, along the river Taff, to the city centre. The owners are very nice and helpful people. The property is very well equipped and the owners show none of the mean-spiritedness of some holiday lets by providing all of the basics like salt, pepper, soap, washing-up liquid, etc. The location is fantastic and there is plenty of space including a small garden. I stayed with my wife, 2 children and my mother and we were very comfortable and made to feel very welcome by the owner, Peter. I must also say that the property is VERY clean, not something I'd normally comment on, but it was so good in this regard as to merit a mention! We'd happily stay at this apartment again. Wow - thank you for those kind words - we aim to please and love to get feedback. From the time we first started doing this - we wanted to provide a place that we would also be happy to stay in and wanted people to enjoy Cardiff as much as we like living here, so anything we can add to make your stay an enjoyable one is not a problem at all. The unique Victorian, tree lined, conservation area of Pontcanna set in the heart of Cardiff, is the London equivalent of Chelsea. Built around 1895 these very large 3 storey houses were originally built for all the various sea captains and coal barons that helped to build Cardiff. The ‘village’ atmosphere of Pontcanna in unique in that within a 15 minute stroll you can be in the city centre or even in the tranquillity of the beautiful castle grounds or national museum. Pontcanna has a bespoke selection of locally run cafes, bistros, gastro pubs and one or two traditional pubs. It is also home to the famous Le Gallois and Cameo restaurants. Surrounding all of that you have the beautiful Llandaff fields leading up to the Cathedral. For long stays please contact about the rate.Last minute bookings are available, but please enquire for the price as this will not be the standard rate.The rates will change for major event dates - we will quote individually for these Cancellation policy 100% refund for cancellations more than 30 days before check-in date only. Between 4-2 weeks to booking 50% refundable. Within 2 weeks. Cancellation after this time is non refundable as we will be highly unlikely to re let the property.